While New Zealand Australian taxpayers support the East Timorese mini-state and ANZAC troops risk there lives to maintain peace, Cuba is busily indoctrinating the populace. Cuban literacy programs are used throughout the third world and even in New Zealand and the US. They are more than "literacy" programs-they are in reality socialist indoctrination schemes. Now they are being used to to return East Timor to what it was pre 1975-a socialist mini Cuba on our back doorstep. From the Australian Marxist-Leninist journal LINKS. In Timor Leste [East Timor], which is one of the world’s newest countries and Australia’s poorest Asia-Pacific neighbour, Cuba is delivering an educational aid program which aims to eradicate illiteracy, currently affecting nearly 50% of the adult population, within a period of less than 10 years. 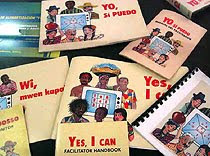 The Timor Leste national literacy campaign, utilising the Cuban-developed Yo! Si Puedo (Yes! I can) audiovisual teaching method, opened its first classes in the capital Dili in June 2007. Eighteen months later, by December 2008, nearly 18,000 adults had completed a course of 65 lessons, led by local village monitors who work under the close supervision of 36 Cuban education advisers deployed throughout the country. If it continues at this rate, the literacy campaign can be expected to have a major impact on the stabilisation and development of Timor Leste, providing a model for other Pacific countries struggling to overcome their educational disadvantage. Why are the Australian and New Zealand taxpayers supporting a country that allows this program to continue? I think we need to send the Indonesian army in to clean out terrorism again. wow cronies do exist. If you had actually been to Timor Leste then you would understand what the Timorese want and need for their own self determination. Comments from tired old couch potatoes who think they have a red under the bed and know everything is not what Timor needs...you need to ask the Timorese. Hau malae, mabe hau gosta hatete "O" ba het! o lae hatene boot ida. "Now they are being used to to return East Timor to what it was from 1975 to 2000-a socialist mini Cuba on our back doorstep." East Timor was a mini-Cuba during the period it was occupied by Indonesia? Come off it Trev! I found your blog on google and read a few Thanks for the information you mentioned here, I'm looking forward to see your future posts. Cheers !! Please come visit my site Tucson Business Directory when you got time. So now you are saying East Timor was a mini-Cuba prior to 1975. Prior to 1975 East Timor was a Portugese colony. So once again, how does that make it a mini-Cuba? Damn right Sam-after the 1974 portugese socialist military coup East Timor swung hard left-until Indonesia invaded.